I’ve spent more time obsessing over finding a credible bike certification that I probably should have. I wanted to be able to teach basic skills to kids and adults and have some level of certainty for participants that I knew what I was doing. I was also looking for a program that could provide insurance for volunteers who help with the town bicycle committee’s fund rides. There are other programs that focus on mounting biking, but that’s not what I was looking for. I started looking at the League of American Bicyclists’ certification program years ago but the classes weren’t offered anywhere nearby so I was never able to get the basic coursework done. Then CyclingSavvy popped up and I considered them, but again the nearest courses just weren’t near. Both programs were also big time requirements and a more money than I wanted to spend. After we went through the League’s Bicycle Friendly Community program (and were awarded silver - yay! ), it became clear that we needed a local LCI to be able to rank higher in the program. Last fall, the bicycle committee bit the bullet and invited Galen Mook, executive director of MassBike, to come to town and teach the prerequisite Smart Cycling course (which used to be called Traffic Skills 101) here in Provincetown. Going through that 2-day class made it really clear to me that there’s a lot of jargon in the bike training world, some very specific things that get taught about how to handle a bicycle, and more bike mechanic skills needed than I ever expected. It also became evident that Provincetown is really a world of its own, without the sprawling multi-lane roadways that the course teaches folks how to navigate. I also felt incredibly silly riding around town in a helmet and high-visibility vest. I made it through that class successfully and then started looking at hosting an LCI seminar here. It turned out that the requirements set a really high bar, which may be why this training isn’t offered in many places. It looked unlikely that we’d be able to get the minimum number of participants needed to hold it here. After forming Pedal Ptown as a business and realizing that insurers really did want some kind of third-party validation that I know what I’m doing, I looked at the schedule for LCI classes again. 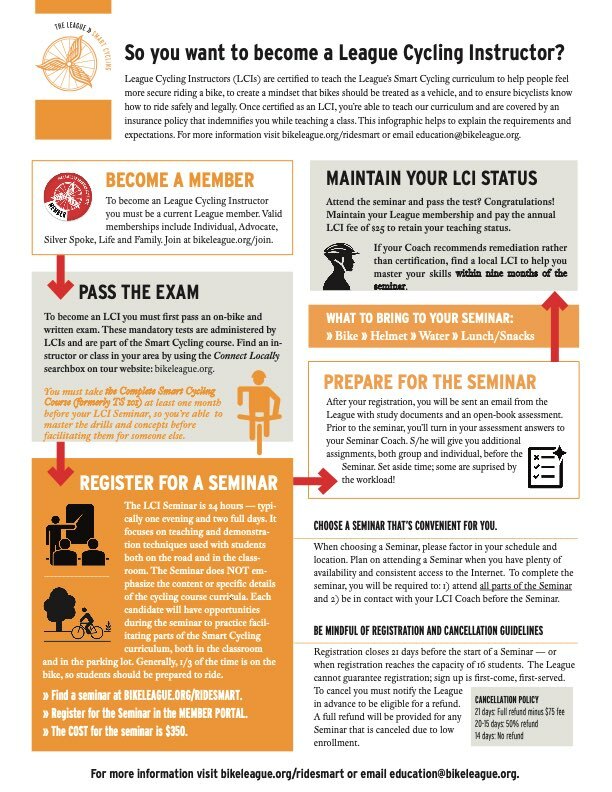 There was a handy “how to become an LCI” flowchart available, which kind of points out how not-simple the process is. Nothing was happening on the east coast until mid-summer, which would be when I’d be working the most and can’t get away. So I found a class taking place in San Francisco at the end of March and signed up. I picked the SF class since I used to spend a lot of time there for work back in the early 2000s, so the city is a place I know my way around. But I’d never ridden a bike in SF, since bike lanes and bike share didn’t exist back then. After makings sure my $50 League membership was up to date, I paid the $350 for the registration fee. Then I booked a $300 flight to San Francisco, $50 in bus tickets to get to the airport in Boston, and $300 for a hostel to stay at. That’s $1,100 committed to this and I haven’t even left yet. When the instructor (a League Cycling Coach, of which there are only a handful across the country) got in touch, I realized the course materials were more than I bargained for. I had to complete a 70-question exam and score at least 85% just to be able to attend the course. And I only had three days to study and submit my answers. The materials were a lot to digest: A 178-page LCI Manual, the 50-page Smart Cycling Manual, the 15-page Parking Lot Drills Manual, and the 20-page Bicycling Skills 123 Youth Manual. When I started taking the exam, I realized there were trick questions, vague multiple-choice answers, and questions whose answers aren’t anywhere in the study materials. My first attempt scored 80%, and I was given the chance to improve my score, which I did to meet the threshold for the class. I spent far more than the 5 hours expected by the instructor. The things I had the most trouble with? The parking lot drills, which I’d only done once back in October, and the mechanic questions. Even with handy flash cards explaining the drills, they’re something I will really need to do in person to nail them down and be able to explain them coherently. A lot of it is muscle memory built up over time by repeating an action (like signaling) so that it becomes second nature. I am not a bike mechanic, and I never will be. We do a “bike repair clinic” during our Bike Month activities, and the first time we showed people how to change a flat their response was “I’ll take it to a bike shop.” I felt the same way. Few people work on their cars themselves these days, and even fewer folks here work on their own bikes (beyond tightening a screw or adding a bell or basket). With five bike shops, the only time you’re without a bike mechanic here is in the dead of winter when they’re on vacation. To prepare for the class next week (! ), we work in pairs to teach a particular subject and also each have to present an individual class segment. Mercifully, the presentations are short, and hopefully there will be lots of feedback on how to improve to League standards. I was assigned Group Riding for my individual presentation and Hazard Avoidance that I’ll be doing with another participant who is in San Diego. I know from experience over the years that I learn best by teaching someone how to do something, so I’m looking forward to the practice. It will take some time to nail the lingo and jargon, though I will probably avoid the jargon in my own classes. This weekend I’ll be out in a parking lot practicing drills. Hopefully the weather will hold. We were asked to bring gear for a night ride the first night, including a reflective vest and lights. I’m renting a bike, so I’ll be using someone else’s gear for the most part, including a rental helmet (I don’t want to slog a helmet through the airport). I’m going to see if I can borrow a Department of Public Works jacket to take with me, since they’re bright yellow. It’s been nearly 10 years since I’ve been on a plane, and despite my Million-Miler frequent-flyer status on American, it’s still anxiety-provoking. I’ll be traveling on a Wednesday (cheap airfare), so I have a couple of days in SF to kick around, find the vegan restaurants, visit bike shops, check out the local bike share, ride a scooter, and get familiar with the city as it is today. I’m staying a couple of extra days after the class (cheap airfare) and hoping to do some market research on bike tours (e.g., go on a couple fo tours!). One thing that’s great about travel: Returning home to Provincetown is always a huge sense of relief, and I will appreciate this wonderful place much more after having spent some time away.